UFC women's bantamweight champion Ronda Rousey will kick off the New Year for the UFC on Saturday, January 2, as she defends her title for the seventh time against unbeaten Holly Holm in the main event of UFC 195 at the MGM Grand Garden Arena in Las Vegas. Rousey made the announcement on the Friday edition of ABC's Good Morning America. "She's definitely my biggest challenge to date, so I'm super excited about it," said Rousey. Named the most dominant athlete in the world by Sports Illustrated in 2015, the 28-year-old Rousey also picked up a pair of ESPY awards this year for Best Female Athlete and Best Fighter. While acclaim has been growing for the 2008 Olympic Bronze medalist, Rousey has continued to take care of her business in the Octagon, defeating Cat Zingano and Bethe Correia this year to extend her unbeaten record to 12-0 with 12 finishes, with her last four victories coming in a combined 130 seconds. "I prepare for a five-round war every time I get in there," Rousey said on Good Morning America. 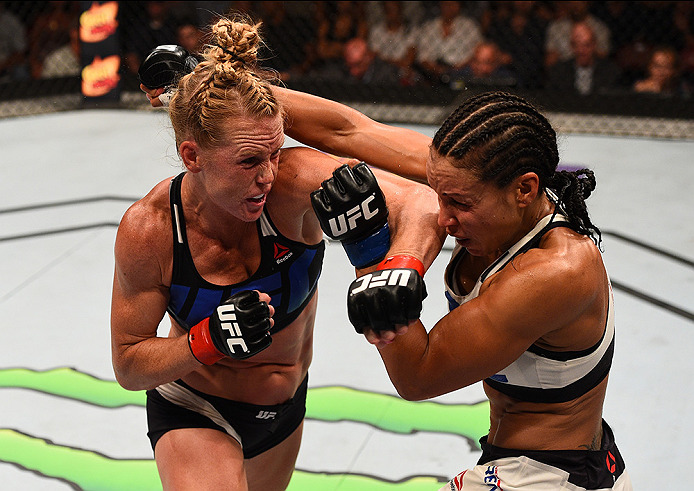 "No one's easy until after you beat them, and with Holly Holm, she's the type that is ready to go 12 boxing rounds. "She's not the average chick that I fight. She's the best striker I've ever fought, and striking is something I learned much later in my career. So I don't ever expect fights to be easy and fast. No one knows exactly how the fights are going to go, and that's why everybody buys them." In the 33-year-old Holm (9-0), Rousey will be battling the most accomplished striker she has ever faced, a three-division world champion in boxing who retired from that sport in 2013 ranked as the pound-for-pound best by The Ring magazine. Since moving to MMA full-time, Holm has continued to impress, and since debuting in the Octagon this year, she has defeated Raquel Pennington and Marion Reneau to earn a shot at Rousey in January. Stay tuned to UFC.com for more information on UFC 195, including ticket on-sale info and fight card announcements.